‘Experiencing significant trauma in childhood considerably increases the risk of misusing drugs/and or alcohol. 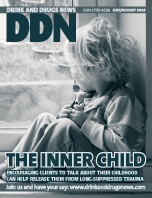 ‘Research tells us that our early life experience programmes the brain and the body for the environment that it encounters,’ writes psychotherapist Elaine Rose in her article ‘Behind Closed Doors’, talking about effects of abuse in childhood and its links with substance use – one of the the most difficult and complicated issues we encounter. Carrying the burden of such experiences should never be the hidden problem that stands in the way of treatment and help, when our professional skills can be tuned in to start the healing process. We need to acknowledge the scale of the problem and do much more to reach out to those affected.